The ability to beam video to a HDTV screen without wires has been promised for quite some time, but the product methods on offer (DLNA, Miracast, Wi-Fi Direct) have proved to be disappointing, complex and/or problematic. This update adds an additional option. With mighty Google behind it, inexpensive Chromecast would seem a sure winner. But right out of the box it can be problematic because it insists on network capabilities (access to Google Public DNS servers) that make it incompatible with some wireless routers. (See Chromecast Router Compatibility) Past that point things can look good at first blush, as when casting the screen of an Android mobile, or streaming YouTube video. But push it a bit harder and warts appear. Local video (from Android mobile or Chrome browser) is limited to 720p and relatively low bit rate by default, with poor quality, and even when pushed to its limits, quality is still only mediocre at best. So if you care about video quality, Chromecast is really just another Internet streaming option. Many "smart" HDTV sets claim DLNA Player support, which should make it possible to beam video to them over a network connection (wired or wireless), and the ubiquitous Windows Media Player includes DLNA Server support. (See Media Streaming with Windows 7) But try to make it work and you're very likely to run into compatibility problems, since many HDTV sets are very fussy about what video formats they will (and will not) play, and Windows Media Player does not support transcoding between formats. (While there DLNA servers that can transcode on the fly, they can be difficult to set up, and the resulting quality is often mediocre. Your best bet is to use Handbrake to transcode to MPEG-4 in advance.) But even when it works, video quality is noticeably inferior to a wired HDMI connection. Bottom line: Beaming of HDTV video without wires remains a work in progress. For best quality use a wired HDMI connection. 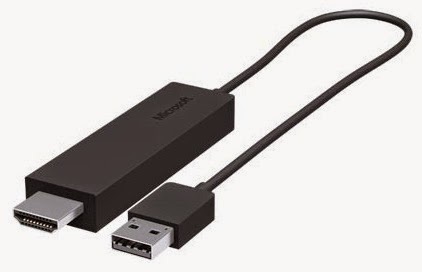 If you must have wireless, Microsoft Wireless Display Adapter is the best bet. Unfortunate casualties of the race to produce ever cheaper computers include hardware activity lights for things like Wi-Fi, Bluetooth, and (perhaps most importantly) disk activity. Without a disk activity light you have no way of knowing if anything is going on in a system if nothing is happening on the screen. There might be a legitimate system update that's just taking much longer than you expected, or there might be malware (virus) wreaking havoc. You can open Task Manager to see what's happening (on the Performance tab), but that's not as convenient and persistent as a proper disk activity light. A good substitute for a missing hardware disk activity light is the small freeware DiskLED. It will reside in your System Tray and light up (as in the picture) whenever there is disk activity on any drive. Thanks to excellent design, DiskLED can also be used to monitor other system activities. It can even be used remotely. The ThinkPad T450s is one of the best new ultrabooks. While it's not as thin as some, it's still quite compact, much easier to service than thinner machines, and the Full HD IPS screen is a standout feature. 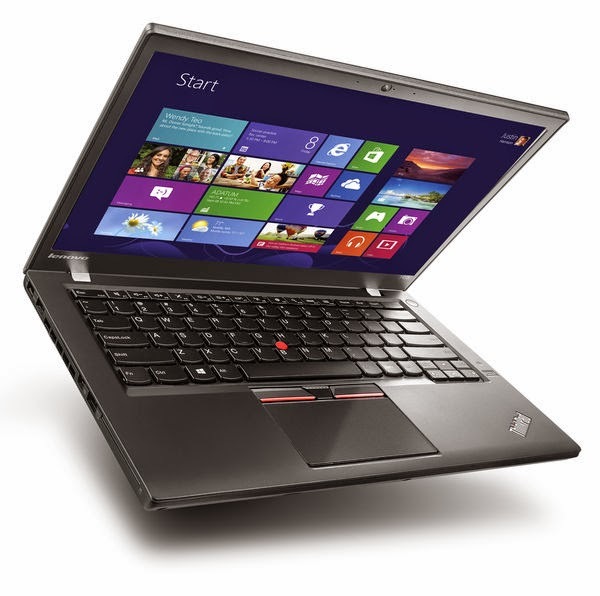 This review is based on a production ThinkPad T450s, Machine Type 20BX, Product ID 20BXCTO1WW. 500GB Hard Disk Drive, 7200rpm, 2.5"
4 GB Samsung SO-DIMM was installed. Hard disk was replaced with 1 TB Samsung 850 EVO SSD. Quality of T450s construction is not up to old ThinkPad standards, with some obvious cheapening, but is still pretty good. Annoyances include the difficulty of prying off the bottom cover (after removing 8 screws) to get to the inside, and fingerprint-revealing textured plastic instead of the old rubberized finish. But it's quite solid, no flexing, and quite compact. The good news is that the Broadwell i7 in the T450s finally proves to be a bit faster than the Sandy Bridge i7 (T420s) on processor intensive tasks like video encoding, despite an ultra low voltage processor running a little slower. The machine is cool and silent most of the time, with only a soft blowing of air under heavy load. The island keyboard is pretty good for what it is, but the layout still suffers as compared to the classic ThinkPad keyboard. Layout of Home End Insert Delete and PrtSc are poor, and other keys like Pause/Break are missing entirely, now only available as Fn key combinations (like Fn+B for Break) that are not marked on the keys. Also annoying is the lack of hardware status lights (hard disk, Wi-Fi, Bluetooth, charging). You can rely on the Windows Task Bar for wireless and charging, but you'll need to install something like DiskLED (which works well) for disk activity. Keyboard backlight is usable (despite some annoying light bleed from the top row), but not as good as the classic ThinkLight. TrackPoint performs as expected. TouchPad is greatly improved over recent ThinkPad generation with the return of TrackPoint buttons, nice smooth surface, and good response. Bluetooth works quite well with the ThinkPad Bluetooth Laser Mouse (recommended). With just the standard 2nd battery, not the extended battery with big bulge on the bottom, the T450s can still be used on and off through an entire day without running out of battery power. The supplied power adapter is pretty small, but only 45W, so can't fast charge when the system is under load. If you care about fast charging you should get the optional Slim 65W Adapter. A mostly welcome return to ThoinkPad form, with a very good IPS screen, and finally enough ultra low voltage processor power to measure up to Sandy Bridge. * Belkin Mini DisplayPort to HDMI Adapter is available at low cost from B&H. The press is filled with stories on online "hacks" (actually cyber attacks) compromising millions of credit card numbers and raising serious risks of fraud and identity theft. So what to do? Fortunately, it is possible to have very safe online transactions. Most online risk comes from trusting your credentials (e.g., credit and debit card numbers) to third parties. 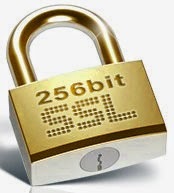 The best way to avoid that problem is with a controlled payment number service like Citi Virtual Account Numbers. PayPal is another good option. Or use an electronic payment service like USBank Bill Pay Online. Regardless, to minimize this risk, change your credit and debit card numbers at least annually. Bill Pay Online is more secure than paying by credit card, debit card, merchant EFT (ACH), or even paper check, because you initiate and have control over the entire payment process, unlike a credit or debit card where you can't easily stop someone from charging you. Online banking is a different matter. If you follow recommended security practices (strong, unique* passwords, changed regularly) online banking through https connections to banks with good security policies does not increase risk over regular banking. ATM machines are actually the weakest link in the banking chain (example). * Never, ever, use the same password for more than one purpose.